Why Am I Working on Worldbuilding This Late in The Revision Process? So you may be asking yourself why I didn’t do all my worldbuilding up front? After all, wouldn’t my world be more consistent, and thus feel more real, if it evolved outside of the story? Shouldn’t I create a story to fit the world? Well, I mean, I think this point has some merit. A lot of people in the fantasy/science fiction genre would agree that it makes more sense to create a complete world before the story starts. And in fact that’s what I started to do very early on in the drafting of Footfall. The issue was I didn’t really have an emotional connection to the world at that stage. I didn’t really know the people. So, I made some decisions on how the world worked, but to be honest they were kind of stupid decisions. I ended up not following the rules for my world and then I ran into a bunch of issues in my previous draft (the mirror-verse draft, as I like to think of it in my head). So what I’m doing now is working with the stuff that makes sense and adding to it in an organic, natural way that also happens to fit the story and the characters, which is very exciting to me. So, yes, I’m doing some re-work, but mostly I’m just shoring up what I already have and building a stronger foundation. So, what does that foundation look like? Well, for me it usually starts with having a good sense of place, and you know what that means. I have to say, this has been my favorite part about picking up worldbuilding again. I’ve always loved maps, and my favorite part of opening a fantasy novel for the first time is checking out what kind of map they have and imagining what the world looks like based on the map’s geographical features. And the process of map making is wonderful. I love creating new lands, adding mountains and coastlines, and figuring out what the people call their land. It’s so much fun. Add to that my love of whiling away hours with a notebook, colored pencils, and a cup of tea and you have a happy Hannah. Honestly, it might be a little tough to switch gears and do other stuff for this build because I’m just having a blast. 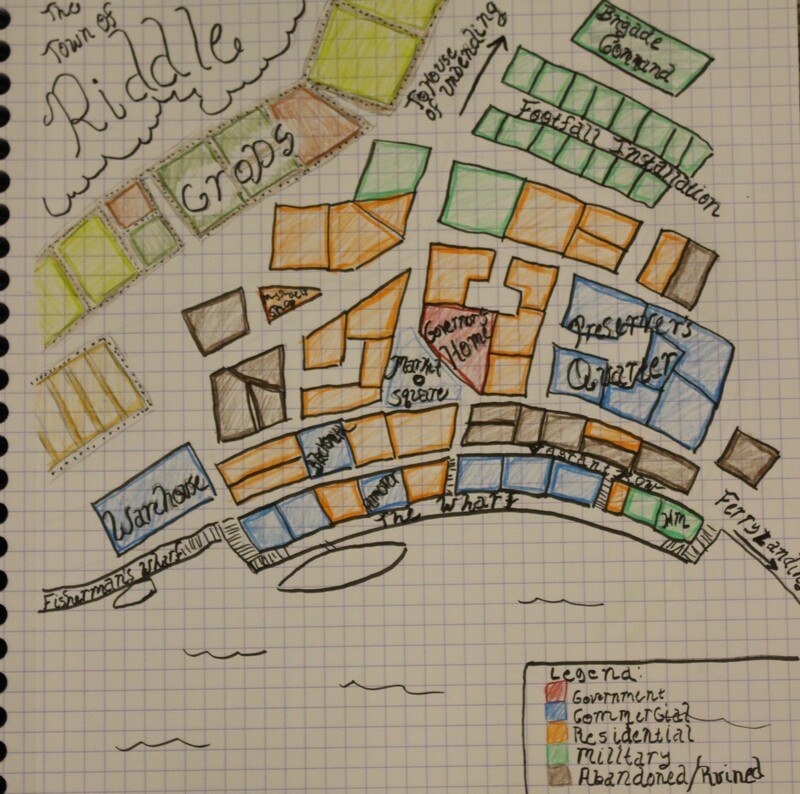 I have three maps complete and plans for one to two more. The one hang up is there are a couple of maps that I can’t label yet because I don’t know their names. Which brings me to my next worldbuilding component. 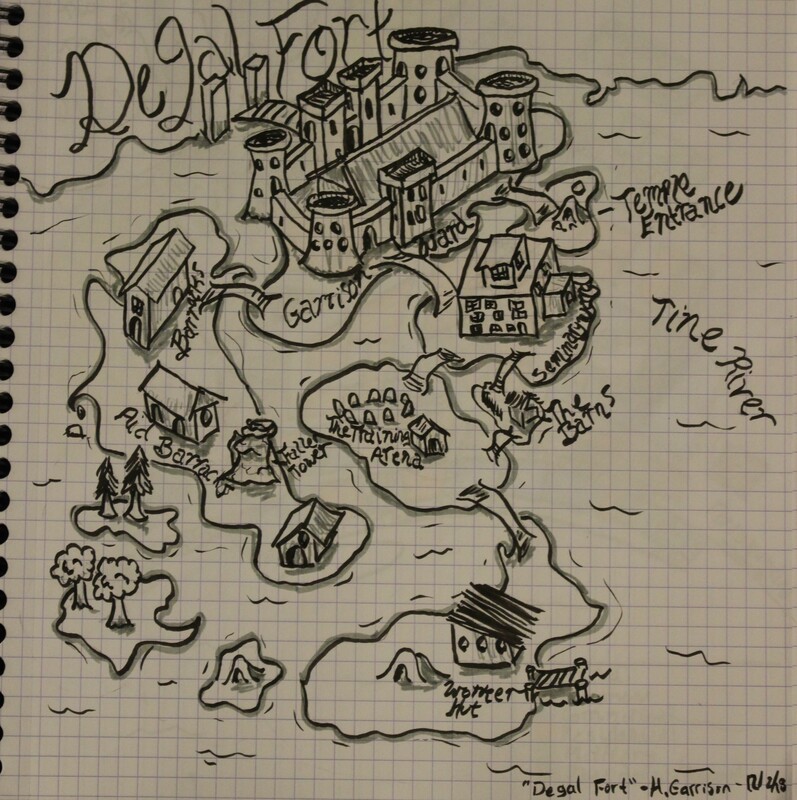 Degal Fort – This map is of one of the primary settings in Footfall, a ruined castle that’s being repurposed as a military base. I was experimenting with the perspective on this one, and I will admit it’s a bit wonky, but I love it still. I’m making up my own language! Well, technically I’m making three … sort of: one language roughly built on English; one completely different language; and one script with a phonemic inventory (but no vocabulary, etc.). I have to admit I am very intimidated by this prospect. I’ve always wanted to create my own language, but have always stopped short because, well, it’s a ton of work! And the idea of messing up something like this is a little terrifying. However, I’ve run into a lot of logic/consistency issues in my book that, as someone who is interested in language, I can’t really let go. I have to fix them, and in order to fix them I need to know the languages of the world. I know I’m not going to be able to do this perfectly, but I’m going to do my best. If nothing else, this will be good experience for me for future world-builds. 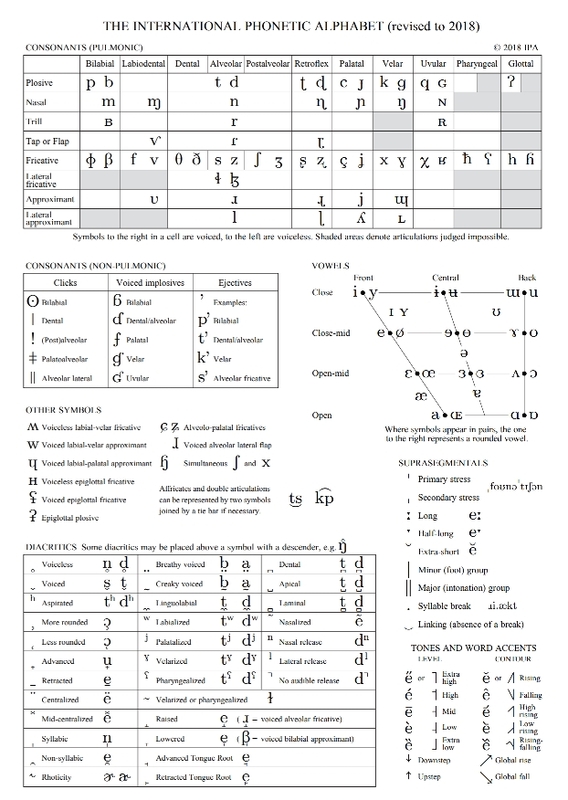 The IPA Alphabet – I’m working on learning this to help with my language creation process. It’s a little overwhelming, but I’m just trying to take the process one bit at a time. Speaking of running into logic/consistency issues while I write, I’ve decided I am going to make a large reference guide for my world. This is entirely to help me remember important facts, names, etc. about my world. The number of times I’ve had to hit CTRL+F to find a character’s name or the name of a certain place has been a little nuts. I do have a spreadsheet of names, but it’s not complete and has some errors, so I just need to sit down and get this all hashed out. Also, I need to work out some holes in the magic system and there are some aspects of the local culture that I haven’t full fleshed out, so I have a lot I can include in this guidebook and working on it will help me make my world more robust and consistent. To help make sure I’ve got all my bases covered, I’ve created a guidebook template based on Patricia Wrede’s Fantasy Worldbuilding Questions (https://www.sfwa.org/2009/08/fantasy-worldbuilding-questions/). There are a ton of questions, but I’m finding them helpful and know I don’t have to fill all of them in. So, what worldbuilding have you guys been up to? Any resources you’re loving that you want to share? I’ve been watching Artifexian’s videos on YouTube and find them super helpful. Also, I do want to apologize for not putting up a post sooner. With cramming in so much work on my novel in November, I just couldn’t find the time. However, I hope to get back into the routine of posting weekly, so look for another post next week! I’ve finished two books recently, so the next few posts will likely be book reviews. On that note, I’ve had an actual request from a publicist to review someone’s middle grade series. I’m super excited at the opportunity, but also want to use this as an opportunity to remind everyone that I am always happy to review books and post those reviews here, Goodreads, Amazon, and anywhere else. I do this for FREE (ethically speaking, I don’t think paid book reviews hold up and don’t want to get into that) and am happy to help out anyone as long as the book looks interesting to me and I can fit it into my schedule. So, if that is something you’re interested in, please reach out to me through my contact page.